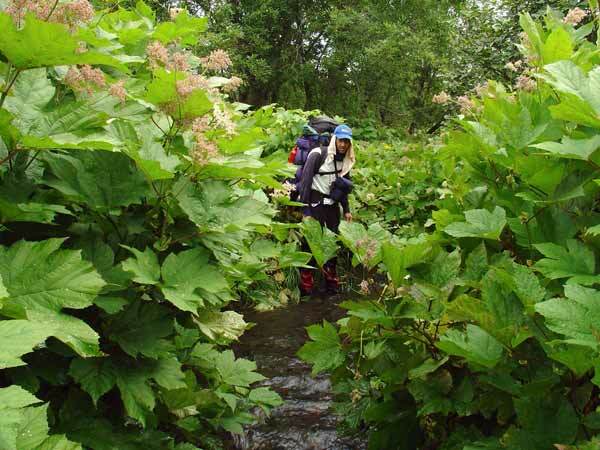 The hike lead us through the wilderness of South Kamchatka. The whole trek was self organized and was without depots. Thus we had to carry EVERYTHING, all food and gear necessary for three weeks. We were dropped off at Kuril Lake by helicopter. 22 days on foot totally self sustained..
16 days from Kuril Lake to Gorely base camp; one rest day at the Lake Bolshoje in Ksudach volcano. 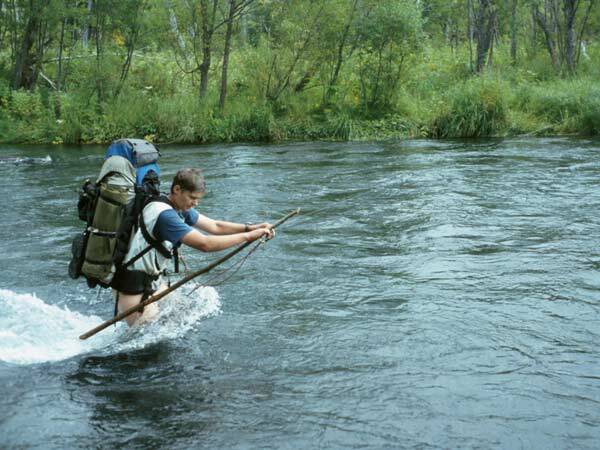 4 'reserve' days which we used for mountaineering in the Mutnovsky region. Very stormy weather: Especially in the Mutnovsky region we experienced some serious storms. It was not always easy to find the way. Often we had to cross thick and dense vegetation of elder or pine bushes, or had to find a suitable path through man-high perennial vegetation... And all that with a fully loaded backpack filled with gear for three weeks. Starting at the Kuril Lake, we hiked to the Volcano Ksudatch with its two lakes - one of them with a hot beach. From the Ksudatch we continued to the Chodutka Volcano, involving an adventurous crossing of the Chodutka River. The hike then continued to the Asatcha River which we followed through birch forest. The last part of the hike involved the ascend from the Asatcha and Mutnaya Rivers to the volcanos Gorely and Mutnovsky. We were lucky with the weather and had great days to climb both of these volcanos. Copyright © 2004 Waltraud Schulze & Andy Heßberg.